In the middle of Agostinis, on a wall that divides hearth from hotspot, is a black and white photograph of an altogether different restaurant – albeit one that bears the same name. 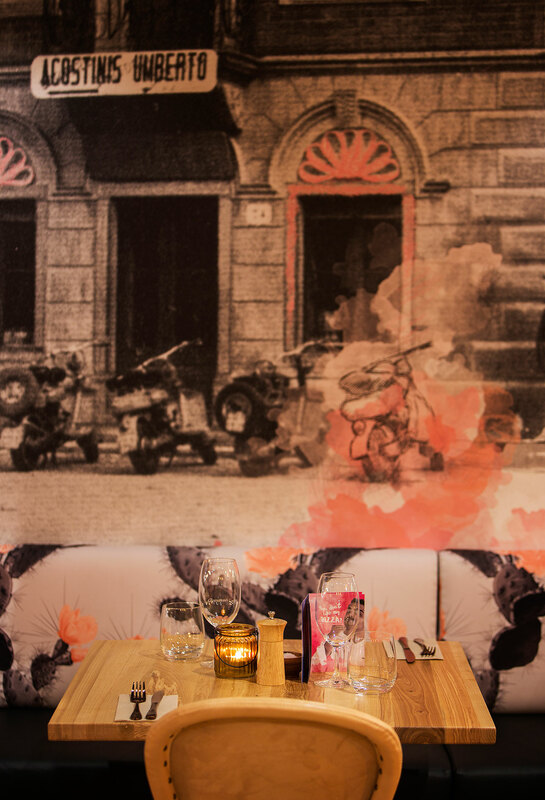 Presiding over a dining room humming with life is a black and white mural of Agostinis, the bar in Prato Carmico, Italy, that was once owned by the grandparents of Marisa Bisa, who emigrated to Australia at age seven with parents bound for the Snowy Mountains Scheme. It’s only fitting then that the mural should take pride of place in the centre of her children Dan and Dion Bisa’s new Italian restaurant, where it functions as a kind of homage not only to their Italian lineage but also to the central place that food has occupied in their lives, both personal and professional, for as long as they can remember. 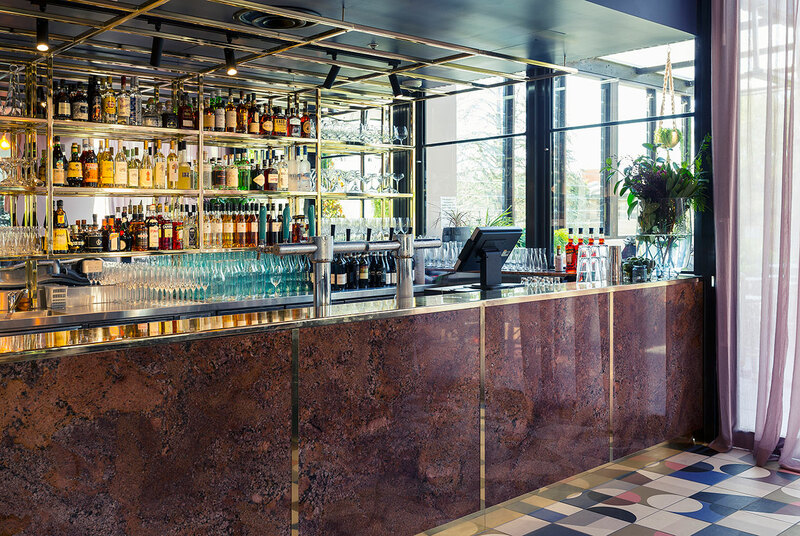 Agostinis is the latest venture for the younger generation of Bisas, the ambitious hoteliers behind Canberra’s boutique East Hotel and its adjoining watering-hole, Joe’s Bar. With an exceeding warmth and affability that’s mirrored in each of their venues, the siblings set out to create the kind of restaurant experience – “an institution of Italian hospitality,” says Dion – that Canberra’s burgeoning dining scene is crying out for: a venue that balances ease and accessibility with style and sophistication; one that somehow manages to cater to all possible facets of life in the nation’s capital, from friends and families to the the staffers of Federal politicians, all of whom can be seen filing into the restaurant’s booths on a recent Friday night. And while the crowd manages to canvas a considerable spectrum of both public and private lives, the booths themselves are also a thing to behold. Interior designer Kelly Ross, with whom the Bisas collaborated on the interior for Joe’s Bar, drew generously on the rich minutiae of Marisa Bisa’s life for her design flourishes – and there are many. Ross tells GRAZIA that she also looked as much toward the history of the region of Friuli Venezia in northern Italy as she did to Marisa’s esoteric style for the restaurant’s abundant finishes. For traces of each, look first toward the stonework feature wall inspired by the cobblestoned streets of Prato Carmico, punctuated with gold accents in a nod to refractions of Italian sunlight off the region’s famed limestone, dolomite and marble reserves. Then turn toward the booths and banquettes that border the dining room. They’re lined with either a fine leopard print upholstery or a blush and grey cactus flower fabric in tribute to the martriarch’s contemporary tastes. 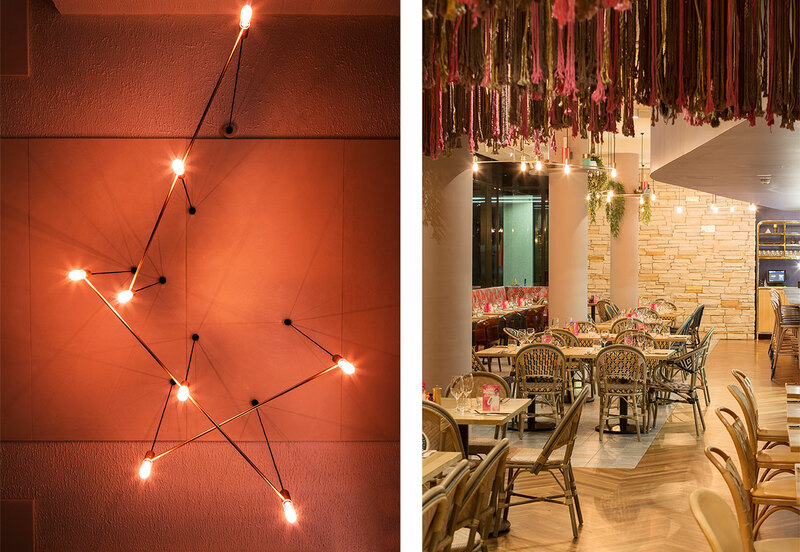 And then there are the three scene-stealing light features that preside over the restaurant’s main dining space – graphic renderings of Marisa’s Libran constellation wrought by Australian designers Anaesthetic Design. Like design, food appears as though it has always been written in the stars for Marisa’s children. At Agostinis, it’s there amongst the stars in the form of the dowel rods that also festoon the ceiling and from which hang nearly a kilometre of rope that has been cut, distressed and hand Shibori dyed by Ross to resemble handmade pasta left to dry in the sun by the children of Italian families. On the plate, however, the honour has been bestowed upon Chef Francesco – Frankie, if you’re lucky enough to meet him – Balestrieri, another Joe’s Bar alumni whose menu was inspired by the traditional cuisine of northern Italy, and is a resounding testament the region’s ability to hero its ingredients in simple and striking ways. 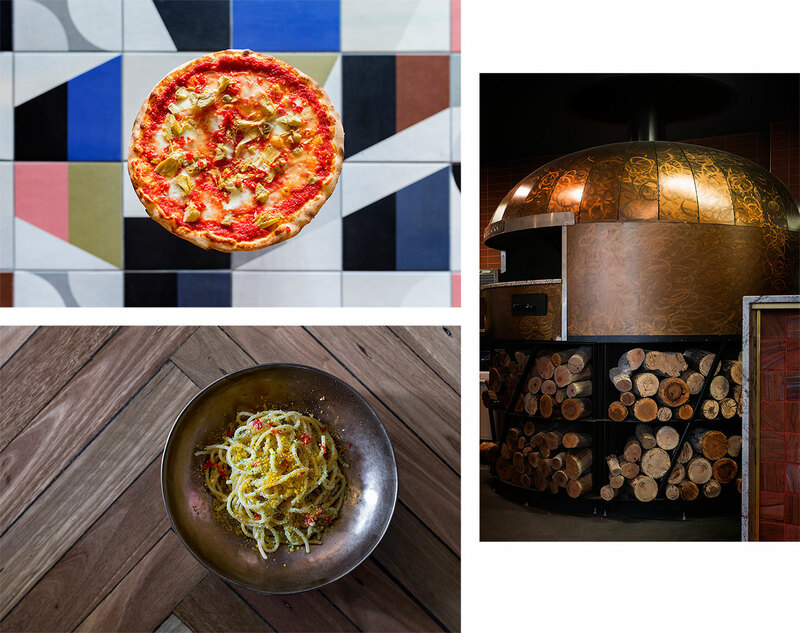 The kitchen’s moreish pasta and pizza offerings, both bianca and rossa, are made in-house to order, with the latter prepared using Neapolitan artisan technique whereby the dough is left to prove for 72 hours before it’s fired in a gargantuan rotating Marana Forni pizza oven that the restaurant had imported from Verona. Where possible, Balestrieri says he has used as much local and regional produce as possible, including a custom made Italian pork, fennel and chilli sausage from a local producer that’s used in a standout dish of Paccheri Salsiccia di Maiale (a tube-shaped pasta coated in slow cooked tomato sugo with a hint of spice). Likewise, the rich olive oil that features heavily throughout, naturally, is harvested from a producer at nearby Collector. The wine list too includes a bespoke blend of Sangiovese, Nebbiolo and Barbera made for Agostinis by a local winery, Ravensworth Wines at nearby Murrumbateman north-west of Canberra. In a surprising twist, a TAP system allows Agostinis to serve Italian made Pinot Grigio, Rosé or Sangiovese on tap with results that tastes anything but. Elsewhere on the menu, the offering remains suitably in the family. Frico, an appetiser based on one of Marisa’s own recipe, is another highlight from which an entire meal could happily be made. Bisa’s not wrong. The stratified layers of featherweight Montasio cheese and potato are roasted to perfection, producing a crispy, salty, comforting taste of home, one that transcends tastes, language and borders – not unlike Agostinis itself. 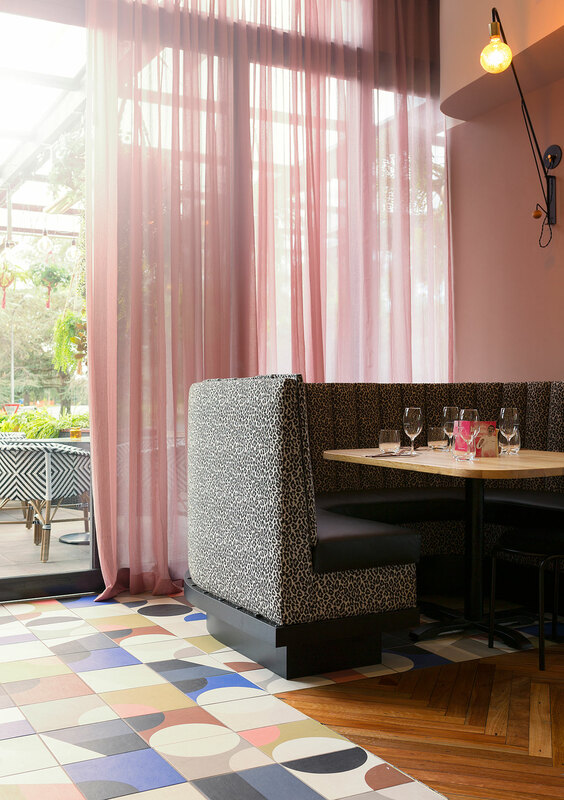 Grazia travelled to Canberra as a guest of the East Hotel. For more information about Agostinis and The East Hotel, visit their websites.